I've been in the game industry for more than 30 years -- my first job, at 14, was assembling and shipping games in the warehouse at SPI. Most recently, I was Senior Game Designer for Backflip Studios, where I was attached to the publishing group, assisting external developers with the design of their games, although currently looking for the next gig. In recent years, I've previously worked for Boss Fight Entertainment, with John & Brenda Romero at Loot Drop, and at Disney Interactive. 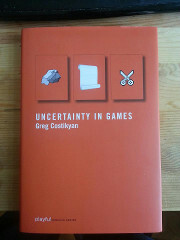 The MIT Press published my book Uncertainty in Games in 2013. I've designed more than 30 commercially published board, roleplaying, computer, online, mobile and social network games; my ludography is here. 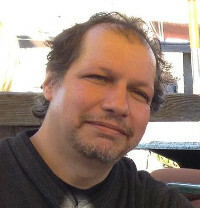 I have, in fact, been something of a pioneer in new and emerging game markets -- I designed the first online game to attract more than a million players (MadMaze, for the old Prodigy COLS), founded one of the first mobile game publishers in North America, and have been working on free-to-play games since 2009. In 2007, I received the Maverick Award at GDC for "tireless promotion of indie games;" I've also won five Origins Awards, and am an inductee into the Adventure Gaming Hall of Fame. I've written scads of articles on games; as well as four novels and a bunch of short stories. My piece "I Have No Words & I Must Design" is widely used in game studies programs across the globe, and I've lectured at universities in both Europe and North America; I also speak frequently at industry conferences. The MIT Press published my book Uncertainty in Games in 2013; unlike most books on game design, it does not cover the whole discipline, but instead goes deep on one particular aspect of games, the role uncertainty plays in making them interesting to play. You can find more about it here. Randomness: Blight or Bane?, an article that examines how randomness, contrary to many gamers' opinion, can be a useful or even essential part of a game's design. My GDC Rant on the iniquities of the game industry, which seems to have established me as the industry's voice of cynicism and despair :). "I Have No words & I Must Design", an essay about game design that despite publication in the obscure journal Interactive Fantasy, has become one of the things that game scholars reference most frequently, and is used in game studies courses worldwide (this is my 2002 update). Presentations I've given at conferences over the years. And lots more content available by browsing the menu-bar links. Copyright © 1995-2017 by Greg Costikyan.